During the 18th and 19th centuries, there were several privately-owned barns or garages in Amherst which were known locally as “fire houses.” The building owners sometimes donated space to house fire apparatus, but in other cases, they were paid a rent by the town. There was once a volunteer East Amherst fire company located somewhere near the common in front of what is now Fort River Elementary School on South East Street. There was also a company in South Amherst and another somewhere in Mill Valley. For many years, too, before the end of the 1800s, there was a company in North Amherst. About 1904, a single bay, wooden station house was constructed for the North Amherst fire company on Pine Street. It was once the home of Amherst Hose Co. #3, formed in North Amherst in August of 1901, with original members Charles Haskins, Frank N. Dickinson, Edwin H. Dickinson, Frank Hobart, George Hawthorne, Edward Puffer, T. Whalen and E. B. Hobart. The building served as a fire station through the 1960s, then was used as a storage building for the Department of Public Works. The building had no central heat or water. 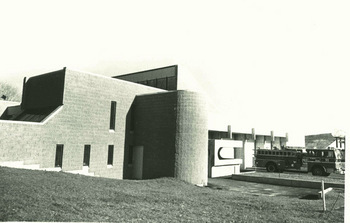 As the university grew and traffic increased in the northern part of town, there was a need for a new building. The Annual Meeting of 1973 authorized funds for an additional station and vehicles to be placed in the northern section of town on property furnished by the University. Today, North Fire Station still looks, in many ways, ahead of its time, a credit to its designers. Visitors over the years have often remarked that the over 30-year old station “must be brand new.” To the front of the building is a large glass-enclosed office that was originally intended to be a dispatch center, known to Fire Department personnel as “the fishbowl.” The garage area has three “drive-through” bays (with 14-foot doors) and a single, smaller bay. One of the important design features of the North Fire Station from the very beginning was allowance for students on the Student Force to live in the station house. A majority of the second floor of the building is devoted to four 2-person bedrooms and living space for students. It was not until the 1990s that female students began living in the station.